When InfoComm International published its series of Dashboard for Controls documents in April 2005, Apple’s iPhone was almost two years away from launching. A decade later, InfoComm’s leadership is helping guide the creation of touchpanel control interfaces, and promoting intuitive end-user operation of pro AV systems has been somewhat usurped by the now-ubiquitous handheld device. He elaborated, “We use parts for very specific functions. So even though they may be capable of other functions, those functions may not fit within the context of the system.” For example, there may be a Blu-ray player in the system, and while it might be enabled for Netflix, that functionality is not going to be supported in the AV system or on the UI. DiQuinzio certainly promotes consistency, if not standardization. “One thing that’s important is you try and keep the same buttons—volume, mute, source selection—in the same locations on every page, because then you don’t have to hunt for anything,” he said. Diversified Systems’ corporate clients are typically national or multinational, which does allow a standardization of the UI throughout their business. “We help them to develop standard room types that they can then deploy anywhere they have an office,” said DiQuinzio. “We’ve found that we couldn’t get away from touchscreens entirely, because there’s a certain amount of information on a more complex system that needs to be displayed and acted upon,” said Theis. 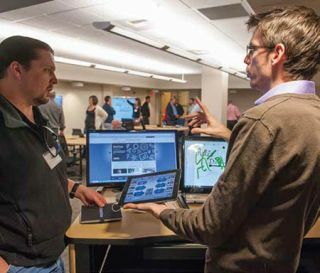 “One of the things that we’re really finding out in AV is the number of things that you can intelligently figure out and just take care of for the user. In the old days, we used to have device power on everything, but now, with advances in technology, we can just automatically handle things like that in the background. And the more things we can automatically handle, the simpler the interface needs to be.